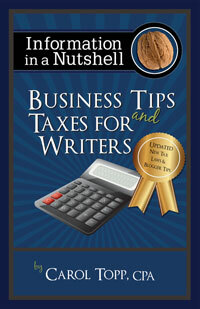 As a writer, you may be wondering how to form a publishing company, or if it is even needed. Join me, Carol Topp, CPA, for a webinar to discuss the steps to from a publishing company, the common and best business structures for authors, the difference between sole proprietorship and an LLC and what are the advantages to being an LLC. It should last about 90 minutes with lots of breaks for your questions. What income do authors make from publishing?